What does this have to do with feeding? Well, many children with extreme picky eating have anxiety around foods, and often have struggled for years. As parents, and even professionals, we hope for and want improvements NOW, or in say, six weeks. But progress is generally slow, slow, slow, and it might not look like what we think of as “progress” (eating new foods). Sometimes when we miss early signs of progress (less anxiety, eating more safe foods, curious about foods but not yet tasting or eating them...) it is easy to want to rush the process, to pick up our little turtles and carry them back to the river or over the road. A parent’s need to help their child is overwhelming. In our experience, having patience and trusting the process, and trusting your turtle to know what is working for them is really hard. 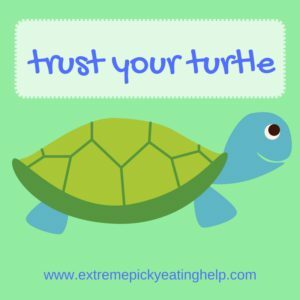 Knowing how to not scare the turtle (i.e., appetite cues or curiosity) and how to help the turtle feel secure is the hardest part. Doing your part to smooth the road out a little bit, flattening some bumps along the way, can give you that sense of participation and help that we all want to feel as parents. It is gentle facilitation that nudges them along without pushing them back into their shell, but recognizing what kind of assistance helps and what kind hinders is unique to each child/parent duo. Being responsive and supportive with feeding and skills-building means that we listen to our children, and let their behaviors and responses guide us as we help them become the best eaters they can be. Helping your child with extreme picky eating isn’t easy, and finding the patience is a demanding and ongoing task. Perhaps try cutting out a picture of a turtle and hanging it on your fridge or inside your cabinet door to remind you that progress can be slow. Learn about and look for early signs of progress*, and find a support network of folks who get it (we love Mealtime Hostage private support group, and we are on Facebook at extremepickyeating too). Hang in there. *Excerpted from our book, Helping Your Child with Extreme Picky Eating.